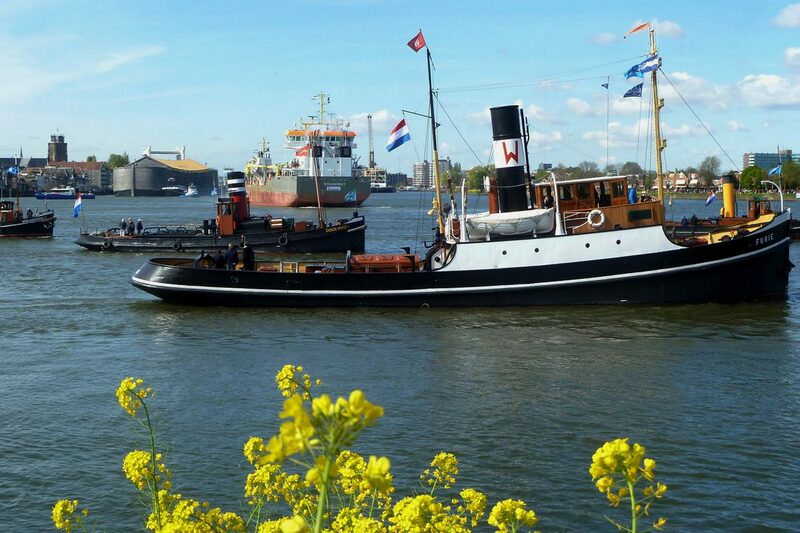 The FURIE is the last steam powered seagoing tug in The Netherlands. 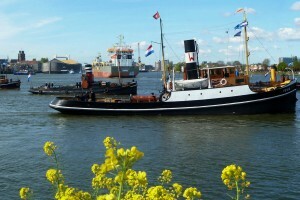 Built in 1916 at Bodewes shipyards in Groningen, she worked until well into the 1970’s for the paper industry in Sweden. She was then purchased for a role in the legendary TV series Hollands Glorie, based on Jan de Hartog’s novel of the same name. In 1978 she became the property of a specially created foundation, the Stichting Hollands Glorie in Maassluis. Over the past 35 years a great deal of work has been undertaken by the volunteers with the aim of restoring her as far as possible to her original state and also to keep her sailing. It is clear that this has been successful given that she has been accorded the status of Sailing Museum and included in the National Register of Sailing Monuments. That the FURIE is officially certified to sail with passengers (max. 40) is unique. Next year the FURIE will be 100 years old, an event that we certainly plan to celebrate. Of course, she needs to be in tiptop order so that we can celebrate her 100th birthday with her in her full glory. However, before the celebrations can begin there is a hefty restoration program that needs to be undertaken. 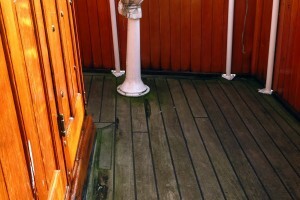 It is essential to replace the wooden bridge deck around the wheelhouse since this leaks in many places. This is a major operation because not only the wooden deck but also the steel under the deck needs to be replaced. We have obtained quotes for the woodwork on the bridge deck from Scheepstimmerwerf De Hoop in Workum and for the ironwork from De Haas in Maassluis. The total cost is about € 90,000. This is a costly operation and one that the Foundation cannot fund, hence this particular sponsor action. We would like to request your help in the form of a financial contribution. If you are willing you can sponsor one or more sections of deck planking for € 250 per piece. What’s in it for you? 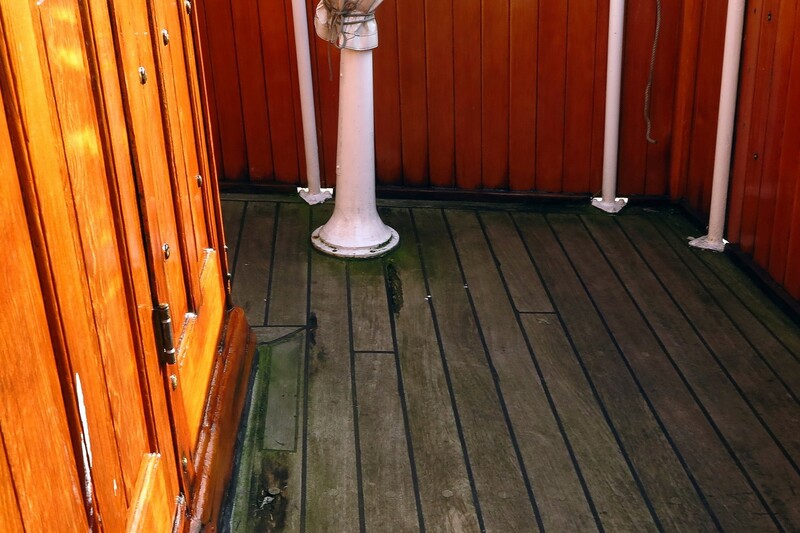 Firstly, you will be listed on the FURIE website as a “deck plank sponsor” and, following completion of the repairs, you will receive a small section of the original deck planking. Additionally, your name will be entered in a lottery and 15 of you will be selected to take a boat trip for two aboard the FURIE. If you wish to become a sponsor please send an e-mail to info@furie.nl with the text Sponsor Action in the Subject field. * The name and full address of the sponsor (and, if appropriate, the name of the person submitting the request on behalf of the sponsor). * The number of deck planks you wish to sponsor. The treasurer of the Foundation will then send you an invoice. The following sponsors have sofar supported 84 deck planks: H. Naborn Maasland, G. Jonkman Maassluis, Dutch Marine B.V. Hulst, Steph & Steph Zeist, Koffeman Consult B.V.Maassluis, Towingline Nieuw Vossemeer, Nexum CM BV Utrecht, M. Raemakers Cuyk, Middelland Beheer B.V. Rotterdam, T. Raemakers Vlaardingen, Euro Rigging Utrecht, Mevr. H. Wegman – Bodewes Ruurlo, Trans River Line B.V. Rijswijk, Appartementsgebouw Furie Maassluis, Gareloch Support Services LTD, Rosneath, Scotland, Gareloch Marine Services B.V. Maassluis, H. de Haas Workum, Damen Shipyards Group, Gorinchem, Vrijwilligers Nationaal Sleepvaartmuseum Maassluis, Ruma Rubber Hoogeveen, Van Oord Dredging and Marine Contractors bv Rotterdam, A. Wesselius Maassluis, Heatmaster B.V. Hendrik Ido Ambacht, Wärtsila SAM Electronics, Rotterdam, ROC Mondriaan, Ubitec B.V. Rotterdam, Bouwbedrijf Nieuwe Maten B.V. Wormerveer, LKL Oceantrade B.V. Schiedam, Herman Sr. Dordrecht, JLT Netherlands BV Rotterdam, Avezaat Cranes Schiedam, J. Ruijsbroek Schipluiden, RSA Nederland Rotterdam,TOS Netherlands BV Rotterdam, J.A. Karssen Maassluis, F. de Nooij Mijnsheerenland, Breman Machinery B.V. Genemuiden, Meemaken B.V. Utrecht, Lions Club Maassluis, B. v.d. Brug Hoek van Holland, E.Peute Maassluis, Neptune Shipyard Aalst. Thanks to the editors of Shipping News, Tugs Towage & Offshore Newsletter, Algemeen Dagblad, Sleep & Duwvaart, Netherlands Maritime Technology and SWZ/Maritime.